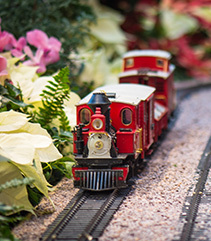 Be the first to see Olbrich's Holiday Express in this exclusive member preview. Enjoy light refreshments and entertainment before or after you take in the show! Members may bring guests for free according to their membership level. Review our Membership Benefits to find out how many guests are covered under your membership. Become a member today and join us for this exclusive preview! Call 246-4724 for more information. Strollers are not allowed in Olbrich's Holiday Express. Please enjoy the show with children on foot. Stroller parking is available in Olbrich's Lobby, and strollers are permitted in the Bolz Conservatory and outdoor gardens. We apologize for any inconvenience. 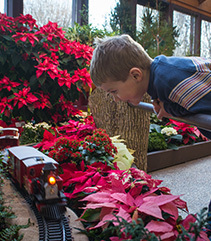 School groups, daycares, bus tours, and other groups are welcome to visit Olbrich's Holiday Express. We hope you will join us for this truly amazing event and register your group for a visit. Groups larger than 10 people must register in advance. Please contact the Registrar at 608-245-3648 or aschwoerer@cityofmadison.com to schedule a time for your group to visit so we can provide the best experience possible for your group as well as other visitors. Limited dates and times may be available for group visits. One group leader and the bus driver will receive free admission into the show. Payment can be made on arrival with the Event Manager. Cash, check, debit or credit card (Visa, MasterCard or Discover) are accepted. Please do not bring carry-in food or drink into the building. Holiday Express was not built in a day! Olbrich Horticulturists and Garden Staff spend weeks preparing the show space, transforming the Atrium from an empty room to an enchanting winter landscape. Visit Olbrich's Holiday Express Behind-the-Scenes to see the transformation! Evergreen trees in the show are decorated with energy-efficient LED lights, which use 90 percent less energy than typical incandescent holiday lights. Visit the tropical Bolz Conservatory, a glass pyramid filled with exotic plants, bright flowers, a rushing waterfall, fragrant orchids and free-flying birds. Olbrich's Growing Gifts shop is loaded with garden-related gifts for friends and family. Stroll the outdoor gardens. Colorful bark, berries, and the Thai Pavilion stand out against the snow. Enjoy festive holiday music on Sunday afternoons at 2 p.m. during December. Olbrich's Holiday Concert Series features holiday music for the entire family!